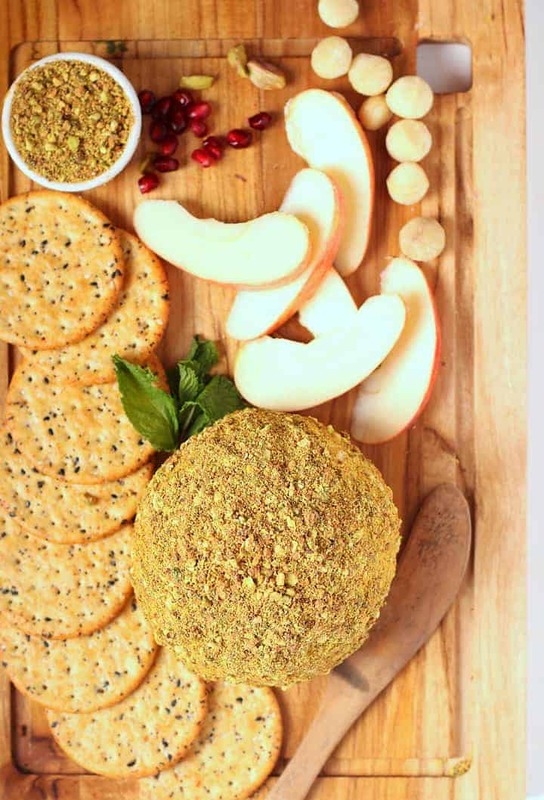 This Pistachio and Pomegranate Macadamia Nut Vegan Cheese Ball makes the perfect appetizer for your next holiday party. Serve with fruit and crackers for an impressive plant-based addition to your Christmas charcuterie. 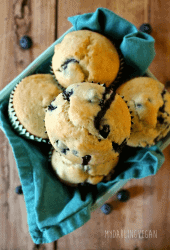 Made with just 10 ingredients! Raise your hand if you either said or heard someone say this. This used to be my response to the rare vegan I met back in the late 90s and early 2000s. I honestly believed that vegans just didn’t get it. They obviously never had truly good cheese or they would understand; I felt sorry them – sorry that they were living their life abstaining from this glorious & wonderful food, and for what? To be radical? To spark up interesting conversations at parties? These were seriously my thoughts. Ah, what a lifetime ago. 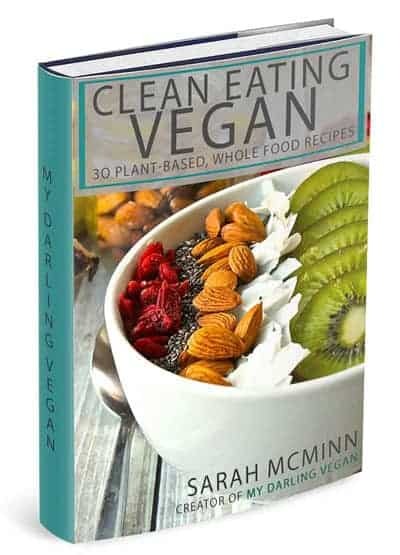 What I learned pretty quickly in my vegan journey as that vegans, it turns out, don’t have to give up cheese! There are so many vegan cheeses readily available that are just as good as their cow milk counterparts. 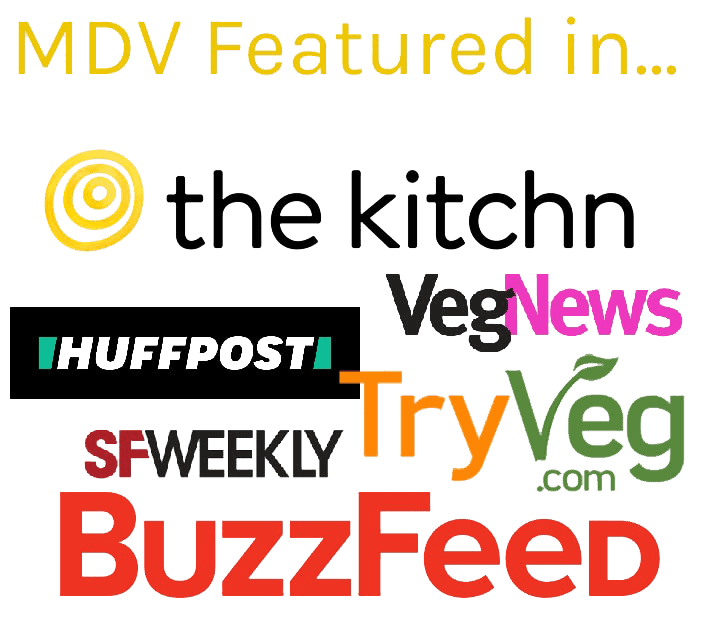 And, better yet, tens of thousands of recipes for homemade vegan nut cheeses on the internet! And, because you can never have too much cheese, I’m adding one more. 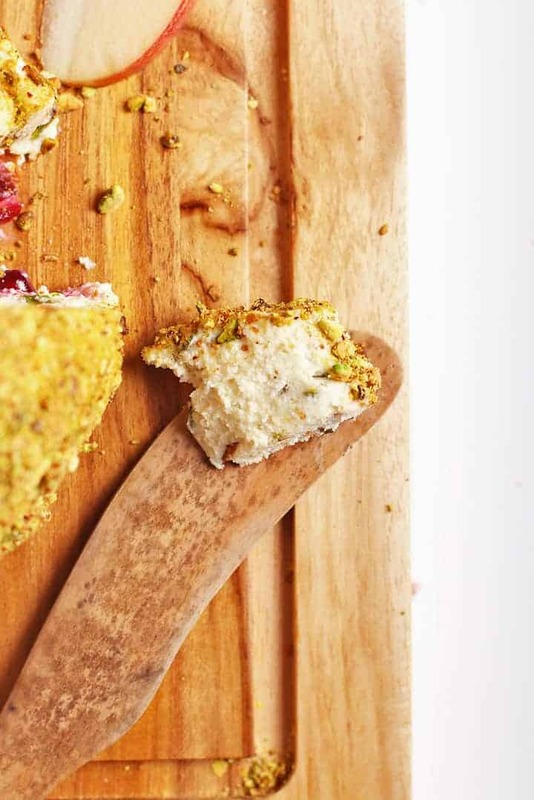 Say hello to this Pistachio and Pomegranate Holiday Cheese Ball! Let’s take a closer look as to how to make this holiday cheese ball. What ingredients do I need for vegan cheese? Vegan cheese typically starts with a nut base. 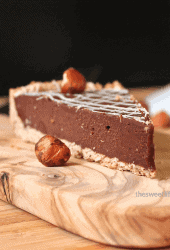 For this recipe, you can definitely use cashews if you prefer. However, I recommend a different soft and fatty nut – the Macadamia nut. Macadamia nuts have a festive flare and subtle flavor that pair perfectly with the pistachios and pomegranates in this recipe. Once you have those ingredients sorted out, it’s a matter of mixing and matching to make the perfect vegan cheese ball for any occasion. For instance, this Buffalo Cheddar Cheese Ball with Coconut Bacon is the perfect cheese for your next Super Bowl party and this Smoked Cheddar with Jalapeño is my favorite vegan charcuterie cheese. But for this holiday cheese ball, I couldn’t think of anything better than pomegranate and pistachios. First, we need to soak the nuts. The nuts should be soaked in distilled water for 4 hours. If you’re in a hurry, you can speed things up by pouring boiling water over the nuts and soaking for just one hour. 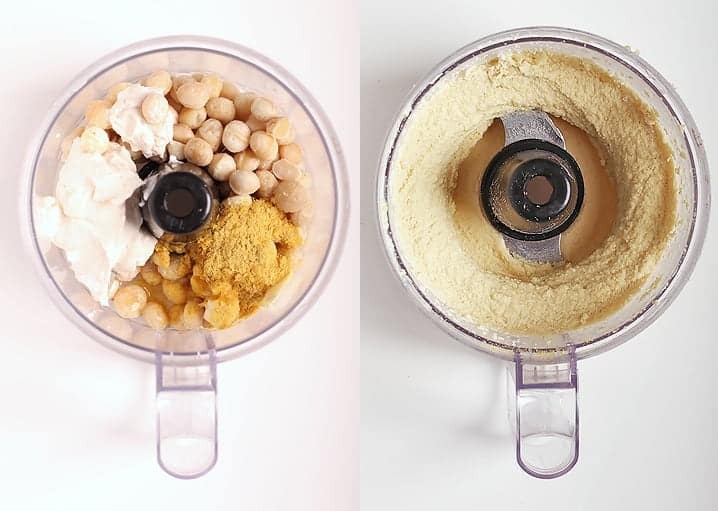 Once the nuts are soft, they get blended in a food processor with the nutritional yeast, lemon juice, salt, garlic, miso, and, in this case, vegan cream cheese. With the motor running, it’s time to slowly add the melted coconut oil until it’s completely incorporated. Now we blend. Blend the nut mixture for 5-10 minutes (depending on the strength of your food processor) until it is rich, creamy, and deliciously smooth. Next, transfer your smooth cheese into a bowl and add your mix-ins. That’s your mint, pomegranate, and 1/4 cup of the pistachios (save the remaining pistachios for the outside of your cheeseball). At this point our cheese will be fairly soft; we need to let it set in the refrigerator. Loosely shape the nut cheese into a ball and wrap it up in plastic wrap. Let it sit in the refrigerator for at least 4 hours or until it has hardened enough to finish molding it into a ball. 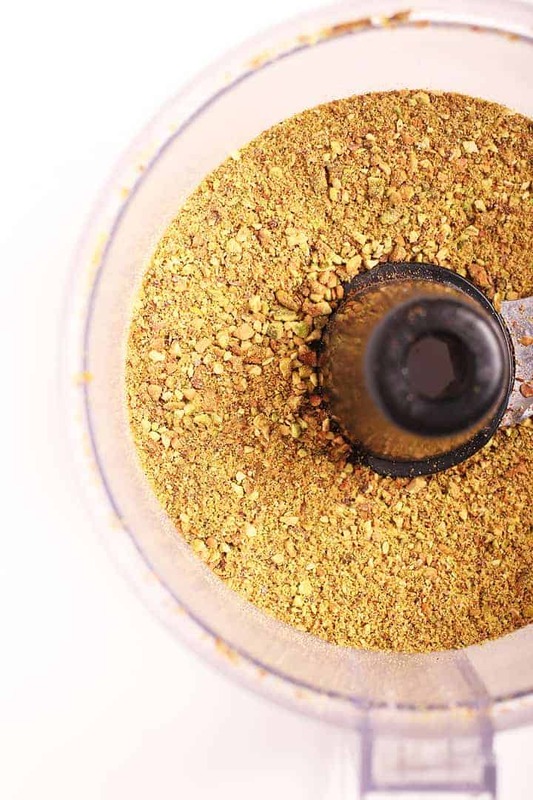 While your cheese hardens, you can crush up the pistachios in a food processor into a fine crumb. Once your cheese is firm, you can shape it into a ball, cover in pistachios, and serve. Your vegan cheese can be served with fruit and crackers or as part of a holiday charcuterie board. Serve it as an appetizer with some Christmas Sangria at your next holiday party or before Christmas dinner. Tips and tricks for making the perfect vegan cheese ball. If you’re short on time, you can speed things up by pouring boiling water of the nuts and letting them soak for just one hour. A quality food processor is important. 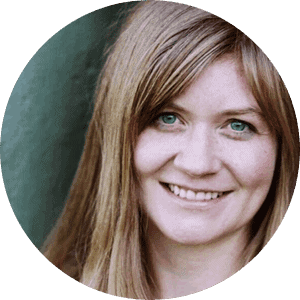 You want to get the cheese as creamy as possible and not all food processors can do that. This is the one I recommend. Make sure to let the cheese blend for 5-10 minutes in the food processor so that it’s very smooth. Your holiday cheese ball should be kept in the refrigerator until ready to serve. That’s it! I think you’re ready to make this holiday cheese ball. Let’s take a look at the recipe below. Pistachio and Pomegranate Vegan Cheese Ball. 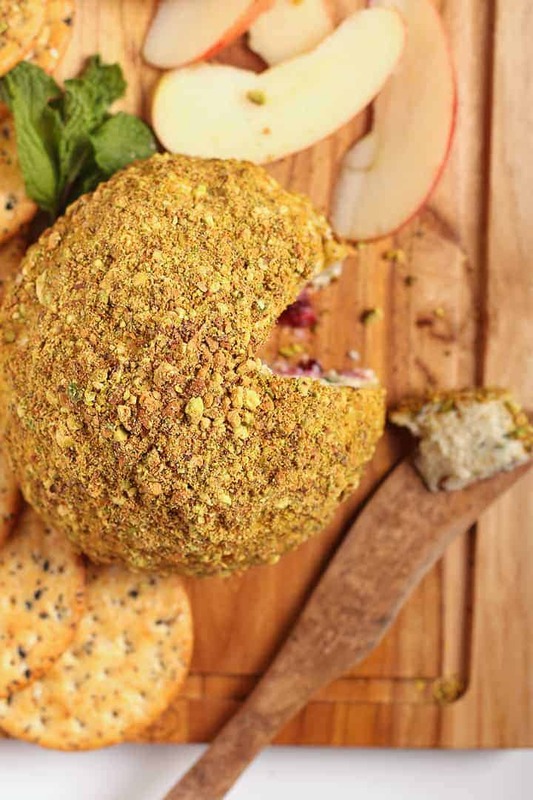 This Pistachio and Pomegranate Macadamia Nut Vegan Cheese Ball makes the perfect appetizer for your next holiday party. 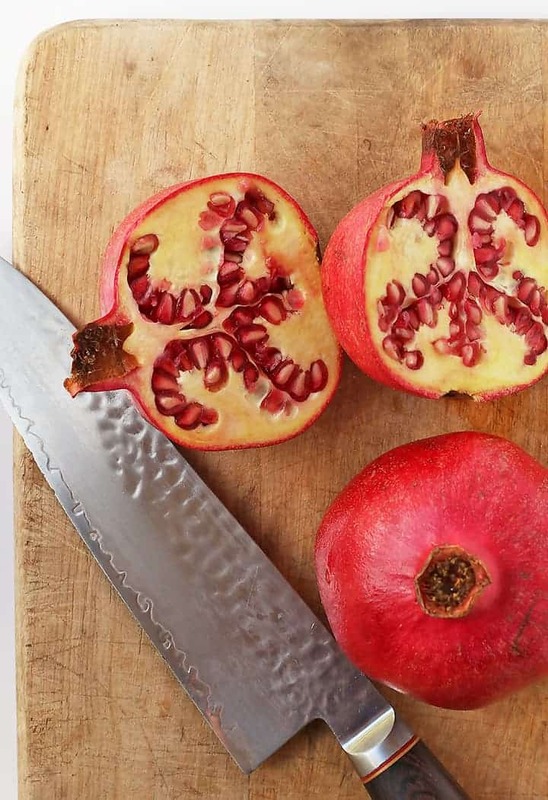 Serve with fruit and crackers for an impressive plant-based addition. Made with just 10 ingredients! 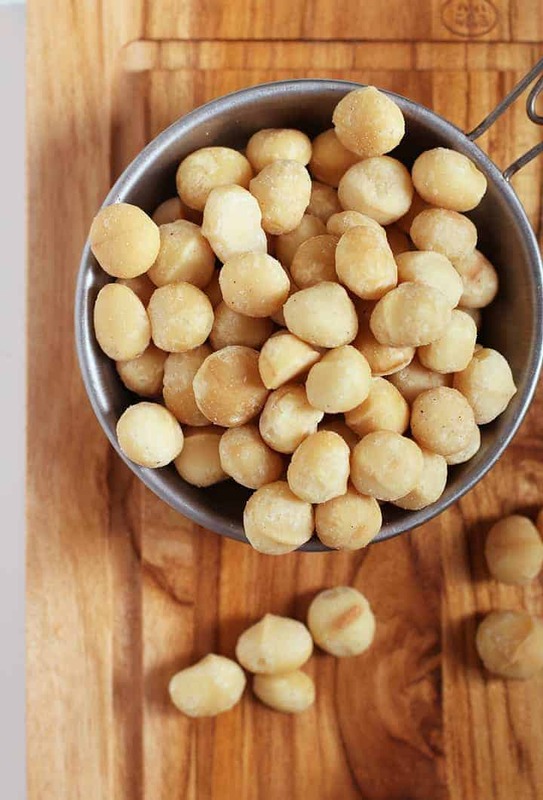 Soak Macadamia nuts in distilled water for at least 4 hours. Alternatively, you can pour boiling water over the Macadamia nuts and let them sit for just 1 hour. Drain and rinse soaked Macadamia nuts. Place them in a food processor along with garlic, nutritional yeast, lemon juice, miso, cream cheese, and salt. With the motor running, slowly add coconut oil until completely incorporated. Blend for 10 minutes or until mixture is very smooth, scraping down the sides every 2-3 minutes. Transfer nut cheese into a bowl. Add 1/4 cup pistachios (roughly chopped), pomegranate arils, and fresh mint. Stir together with a wooden spoon. Transfer the dough into a plastic bag or plastic wrap. Cover tightly and refrigerate for at least 4 hours, until the cheese is firm enough to mold. 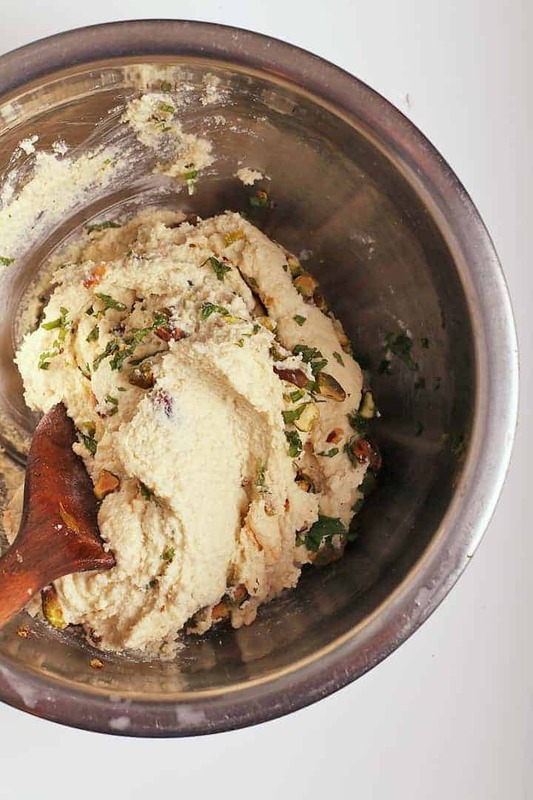 In a food processor, process your remaining 1/2 cup pistachios to a fine crumb. Set aside. One the cheese has hardened slightly, remove it from the plastic wrap and shape the cheese into a ball or rectangle. Coat it in crushed pistachios. Serve with fruit and crackers at your next holiday party. Don't skip soaking the nuts. This is an important step to getting a thick and creamy cheese. Store leftover cheese in an airtight container in the refrigerator for up to 5 days. 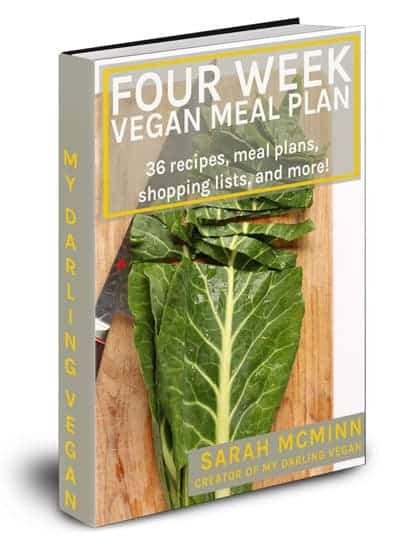 Thanks for the recipes—they have been a great find as we move to a more plant-based/vegan lifestyle. It’s hard to say. You need a fairly soft, relatively flavorless nut for the base of this cheese. 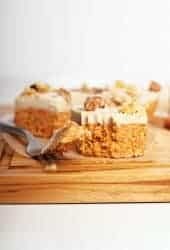 I have heard of people making almond base cheeses with success. If you get blanched almonds and soak them for a couple hours longer, it might work just fine. If you try it, let us know how it goes!